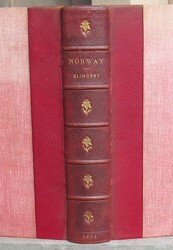 This is the first printing of the first edition of NORWAY THE NORTHERN PLAYGROUND by Wm Cecil Slingsby. This book was published in Edinburgh by David Douglas in 1904. The book measures 228mm tall x 155mm and has 425 pages, 29 b/w photo plates, 3 full-page sketches, 70 in-text b/w sketches, 9 maps, index. One of the scarcest European mountaineering books, this must have been a small production or one where warehoused copies were destroyed. 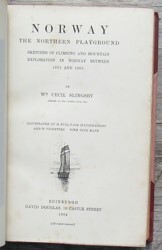 This is the account of the author’s climbs in Norway from 1872 to 1903. He last visited Norway in 1921. Slingsby made many pioneering ascents including the first ascent of Skagastölstind climbing solo. Slingsby learned skiing in Norway and has been cited as the first Englishman to ski & the first to introduce it to the Alps. This book includes a chapter on his 1880 circuit of Horungtinder in winter using skis. CONDITION: Fully rebound in reddish cloth covers with red leather corners and spine with 5 raised bands, lightly trimmed text block with top edge gilt, marbled EPs. The spine has gilt lettering and small gilt decorations. The binding is probably from the 1930s.. About 7cm of the front endpaper has cracking at the hinge but most of the EP is not cracked and it is still strong and holding well. There is light foxing on a few pages, but most pages have no foxing. The binding is tight and strong. There is some light rubbing at the spine edges and tips of corners, mainly just a little loss of the dark red coloring. There are no previous owner marks or writing on any pages. Clean. Complete with all plates, maps, and pages. Price: $1125.